Klondike is a game that is part of a group called Solitaire card games, also known as Patience games outside the U.S. and Canada. Over the years, the name of the game has changed to merely Solitaire, so the word Klondike is often left out. The game has been around for a long time, but, like many card games, it does not have very clear origins, since not enough historical information is available. There are three plausible theories, however, which we describe below. It is generally accepted that some forms of the game were developed in the Middle Ages, when card games became increasingly popular. The most commonly accepted idea is that the French were responsible for its development, since a number of words related to the game – such as the words “tableau” and “Patiens” – come from the French language and there are many older books that describe variants of Solitaire that come from France. Some historians even claim that the inventor of the game was General Napoleon Bonaparte. He is supposed to have thought up the game to pass the time while imprisoned on the island of St. Helena. There is even a variant of the card game with the name “St Helena Solitaire”. Even though some of the words come from the French language, that doesn't mean we have to assume that the game actually came from France. It is quite possible that the game was invented in Germany; the first known book that describes the game of Patience was published in 1788 and is written in German. 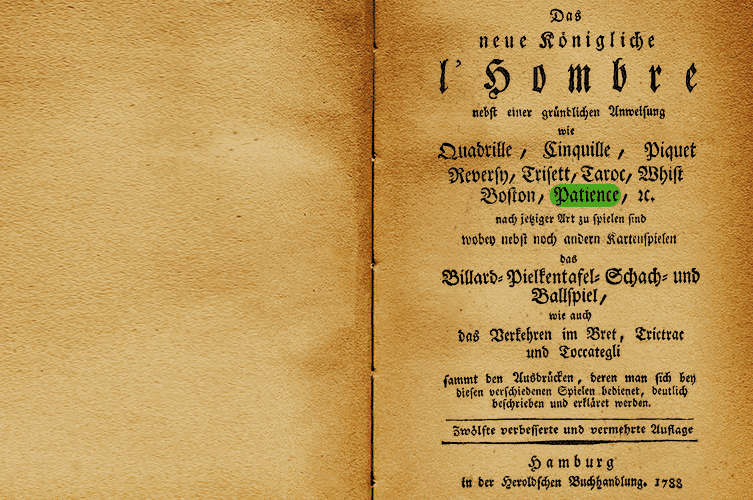 The book is entitled “Das neue Königliche l'Hombre-spiel” (see picture) and is part of a series of which the first book was written in 1705 by Benjamin Schillern, a book about the game “l'Hombre”, which was popular at the time. Throughout the 18th century, there were regular updates of this book by German publisher “in der Heroldschen Buchhandlung” and new descriptions of games kept being added to the book, such as Reversi, Piquet, and, in 1788, Patience Solitaire as well. Yet other historians claim that the game came into being in Eastern Europe, in the shape of divination. These historians believe that fortune tellers used the outcome of the game to predict the future and that, if the player won often, it meant that their future was looking rosy. But what if the player lost again and again? Then it wouldn't be surprising if trouble was around the corner. Solitaire the way we know and love it began its development in the second half of the 20th century. When people became familiar with computers at the beginning of the 1990s, the game became popular within no time. 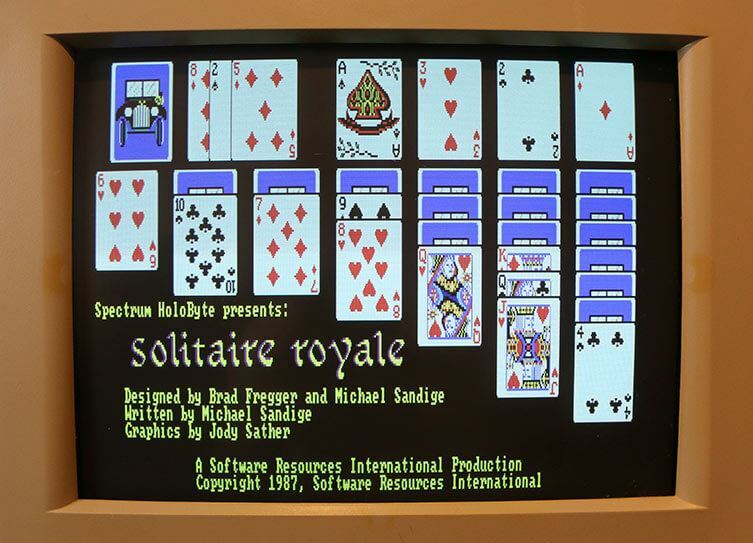 The first commercial Solitaire game for computer playing was Solitaire Royale (see picture), which was programmed by Brad Fregger and Michael Sandige and was designed by Jody Sather. They developed the game for software developer Spectrum Holobyte in 1987 and the game was made available for the Apple IIGS, Amiga, MS-DOS and Macintosh. The game had 16 color EGA graphics (super fancy back then) and included eight different versions: Calculation, 3 Shuffles and a Draw, Corners, Golf, Pyramid, Reno, Klondike and Canfield. Three additional children's games were also available. More and more companies started developing these kinds of games because they were very well received by fans of this genre, but the real breakthrough with the general public came when Microsoft added the game to Windows 3.0. This game was developed by Wes Cherry in 1988 and the design of the playing cards was created by Macintosh pioneer Susan Kare. The development is still in full swing and, with the arrival of the tablet and smartphone, players are no longer bound to the computer and can play their favorite game anywhere in the world. Sadly, we do not know what the future looks like, but we are keeping an eye on all new developments, so the website is always kept up to date and you can always play our card games from any device!